It’s Day three of our mini-retreat, and the energy today is all about consolidation and integration. Today and this evening is the perfect time to review the answers to your questions from the past two days. It’s not enough just to do an activity such as the ones we completed for Day One and Day Two of our mini-retreat. What is important when we do any kind of self discovery work is to sit with our answers and insights and reflect upon them. Where can I make small changes now, to bring me into better alignment with my best self? What activities can I schedule to begin making longer-term changes in my life? Where do I need to sit in awareness around existing situations, behaviours or relationships? Where do I need to find extra resources, information or help for myself or my situation or project? Take time to connect into your Guide, Angel or Higher Self using the meditations I’ve already shared. If it is needed, use that connection to bring through further insights or clarification about the work you’ve done in the past two days. Then rest. Have some quiet time. Be gentle with yourself. I’ll see you tomorrow as we explore how to begin deepening our spiritual and psychic connections. So often we look outside ourselves for answers, forgetting that there is a source of wisdom that is always available to us – our own Higher Self. Your Higher Self is the wisest aspect of you. Your soul. The same soul that has lived with awareness through all of this lifetime, the space between lifetimes, and any lifetimes you may have experienced prior to this one. Your Higher Self is not your conscious mind or your ego, or your subconscious, although it knows all of these aspects of yourself. Instead it is an energy of pure love, compassion and wisdom, imbued with your own unique gifts, talents and preferences. When you are struggling for answers, when you have lost your direction, it is good to reconnect to your Higher Self so that you can work through your issues with guidance from the part of you who remembers your best self and your potential. Your Higher Self also knows your Heart Path – the direction in life that will give you emotional satisfaction and happiness. Today we’re going to connect with our Higher Self and then use that energy and connection to explore some important life questions. A deck of your favourite oracle or tarot cards that you have chosen just because you love their pictures. A little time set aside just for you. The meditation requires 13 minutes and you’ll need at least another ten for journalling. If you have the luxury, allow an hour. Take more time if you have it, and are ready for a big dose of soul work. Know that you have this connection to your Higher Self, continue to hold your crystal to help strengthen that bridge of connection. Yes, it’s okay to put the stone down and pick it up again – but hold the stone when you are writing, or reflecting on a card. Use your time to explore the following questions in your journal. Write the question at the top of the page, and then close your eyes for a moment, and feel back into the energy of your Higher Self. Strengthen the white and golden light. Feel that sense of peace and calm and expansion come upon you. Then open your eyes and write your response. *Important – make sure that when you finish writing your answer, leave space to write one more response below. Give yourself half a page or a full page if possible. What do I most need to know right now? What is my place of greatest possibility in using my talents and gifts? What simple changes can I make to affect greater happiness in my life? What is my Higher Self’s greatest vision for my life? Write as much or as little as you need. You may feel like you are making it all up. That’s okay. Keep writing. Trust the process. When you have finished journalling, take your cards, offer up a small prayer that whatever you do be for your Highest Good, and then shuffle the deck. Now go back to the first question. Read the question again, but not your first response. Shuffle the deck again, asking your Higher Self What else do I need to see in relation to this question? Choose one card. How you choose is up to you. Split the deck. Fan them out. Top or bottom. Dive right in. There is no right or wrong. Now look at your card and hold your crystal in your non-writing hand. Really look at the card. Don’t use the book or the ‘proper’ meaning. We are being intuitive here, people! Trust the guidance of your Higher Self. What stands out for you in the picture? What thoughts and ideas do the images provoke? Take a minute or two and write those thoughts down. You may want to use a different coloured pen for this part. I know, you might still feel like you’re just making it all up. That’s okay. Write anyway. Trust that there is a part of you that is wise and that has been waiting for this chance to speak with your conscious mind. If you need to, draw up to five cards to gain further insight and clarity for this situation. Then move to the next question and repeat the process. Enjoy your reflection time, and if you can, spend a little time in nature today. This weekend has such a powerful ability to connect you in to your own and higher wisdoms. Use that energy well to help you get answers to your questions, and to provide direction for the months and years ahead. I’ll see you tomorrow, when we’ll be connecting in with our guides and angels! How You Can Have Your Own Mini-Retreat Alongside Ours! I always choose my dates carefully, years in advance. (In fact, truth be told, I have retreats booked until 2025!) to coincide with favourable astrological events that will support my students as they work with a particular aspect of their personal or spiritual development. These energies are also available to you! This particular retreat is my Accelerated Channeling retreat. It’s a powerful time for connecting to your own inner wisdom, to your guides, and to the Universal Energies around us that can help us with decisions, healing, innovations and breakthroughs. My course will be an intensive, and the work we will be doing will be at a very advanced level, but the energies that are supporting us in this work will also support you. So, I was thinking that perhaps some of you might like to work alongside us over the next few days, through some simple guided meditations and journaling activities suited to a beginner level. (It will still work for you if you are more advanced, I promise!). Our primary time for making psychic and spiritual connection will be this weekend, and then the following days will be about using those connections to find answers and insights for ourselves and others. From tomorrow I will post some simple guided meditations and questions or prompts for you. I have a girlfriend who is about to wing halfway around the world to gift herself a two-month retreat at a health and wellness clinic. She’s in desperate need, after pushing herself beyond hard for years, trying to get a business off the ground. It’s successful now, but she’s burned herself out getting there. Everyone needs self-care, but what if your life is crazy busy right now? Or if there’s no money in the bank? What if you’re right in the middle of things and you can’t take time off? What if there are people depending on you? It doesn’t matter. Anyone can gift themselves ten minutes. Ten minutes of retreat from the craziness so that you can re-centre and find your equilibrium again. Ten minutes to give yourself a refreshing pause, a chance to tune out, or to tune in. Here are a few ideas for tiny ten-minute mini-retreats that will still have the power to positively transform your day by nurturing, supporting and uplifting you. Ten minutes is the perfect amount of time to enjoy a hot beverage. Or a cold one. Perhaps there is a cafe within walking distance where you can go and choose your favourite latte or ice frappe. If you’re at work or home, deliberately unplug and step away from your duties for ten minutes. Take time to craft yourself a cup of tea or coffee. Put care into the preparation. Make it exactly how you like it. Then sit and enjoy that drink. Sip it. Savour it. Let your mind wander. Look out the window, or sit outside and watch the sky. Be very aware of every sip, every swallow. Enjoy the comfort and relaxation that comes from your drink. You’ll find that you’ll go back to your day refreshed. Tip: To make this ritual even more meaningful, shop for a tea or coffee that will delight you and that feels a little above whatever is your ‘ordinary’. Indulge yourself. Let your tea break be something that you truly look forward to, and that feels like a treat. Studies have shown that holding your focus on one activity for hours really blunts your intellectual axe. Conversely, changing your focus to another activity that is completely different will give your brain a chance to reboot and re-energise. What lights you up? Do you love the challenge of a good word puzzle, Sudoku or a quiz? Do you like to sketch or doodle or to colour? Maybe reading is your thing. Or writing. It could be writing in your journal, or working on a book of your own. Ten minutes of focused activity can refresh you and give your day deep personal satisfaction. This is especially true if you are using that time to plan or work towards something that is meaningful to you. Tip: Keep your art or writing materials in a small bag or desk drawer where they are easy to access. It’s easy to lose yourself in activities like this so use a timer on your phone or computer to keep to the time limit of your ten minute mini-retreat. Sometimes what refreshes us most is the chance to connect with our intuition and to be guided about where we are right now. Keep your favourite tarot cards, oracle cards or runes handy. Set aside ten minutes, calm yourself with a few cleansing breaths and then choose three cards. The first represents your situation right now. The second represents your current obstacles or opportunities, and the third represents the learning and gifts of your outcome. Sit and think about the cards or runes you have chosen. Open yourself to insights and understanding. You may also want to write some of those ideas and insights in your journal, and do a little thinking and planning about what you have been shown. At the end of your ten minutes offer up a small prayer of thanks, and then tidy things away, ready to go back to your daily life feeling clear and supported. Tip: Make sure that you won’t be interrupted during your mini-retreat. Shut the door. Turn the phone to silent, or go to another room, a cafe or the garden. Gift yourself a peaceful ten minutes by setting the scene for strong connection. This is a beautiful ritual – a mini-break you can treat yourself to whenever you need that extra love and care. It helps if you can gather your materials together beforehand and make the effort to create a space that is inviting and relaxing. It’s best done at the end of the day, when you can move from your bathroom to the bedroom and enjoy a restful night’s sleep. Your choice of bubble bath, bath salts, epsom salts and essential oils. (An epsom salts bath is an excellent way to de-stress, get some magnesium into your frazzled system, and cleanse your aura as well as your body. If you’d like to lean more, click here). At a minimum use the salts, but I must say that I love the comfort of some good bubbles too – invest in a good quality body wash or foam that is free of nasty chemicals. You’re worth it! Run your bath and add epsom salts, crystals, oils etc, Make it tolerably hot if you are using epsom salts so that your pores open and you can detox from your lymph and uptake all that beneficial magnesium). Turn on your music, softly, so that it is background music, and light your candles. (Please keep candles away from shower curtains and anything flammable.) Turn off the lights so that the room is dimly lit. If you live in a cold climate, make sure your room is warm! 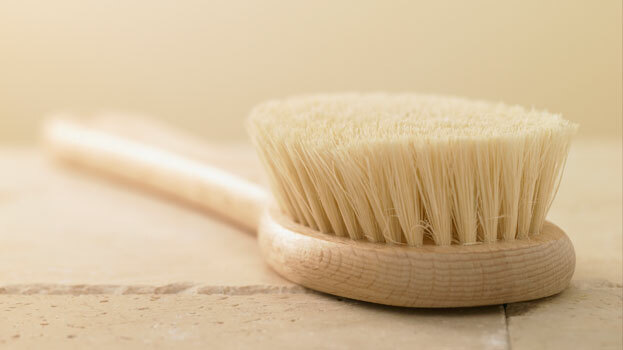 Dry skin brushing stimulates our lymphatic system, helping us to detoxify and to improve our circulation. It also removes dead skin cells and leaves our skin softer. Over time this beneficial practice can greatly aid your health and well-being, strengthening your immune system. It’s also great for cellulite! As you brush, always direct your strokes from the extremities back towards your heart. As you dry brush your body affirm to yourself I am ready to release. I am letting go. Say it softly, over and over, as you brush. Undress, then take your bristle brush and starting at the toes of your left foot use short smooth strokes to brush up to your knee. Then work from your knee to your groin. Cover your whole leg using a soft but firm pressure. Now work from your fingertips on the left arm up to the armpit. Swap and do your right arm. After this do your back, using long sweeping movements to go from your shoulders down to the middle of your back. Then brush from your buttocks back up to the middle of your back. Finally brush the front of your body – from your shoulders towards your heart and then your belly in a clockwise direction. Avoid your face, but do include the back of your neck. Settle in and get comfortable. Then place your hands so that they are resting on your heart. Gently repeat the words Thank You on every out breath. Do this for as long as you stay in the bath. These two little words will powerfully shift those negative emotions and energetic blocks within your body, opening you back up to peace and flow. Fee yourself soften and relax. Don’t struggle with your feelings. Allow any trapped or suppressed emotions come to the surface, stay focused with your hands on your heart and keep saying thank you. If you need to cry, do so. But keep saying Thank You. 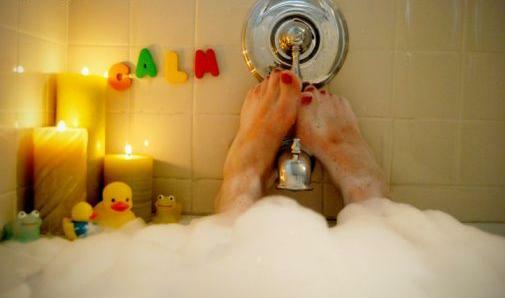 When you feel calm and centered, step out of the bath. Turn on the shower (pull the plug if you have a combined shower/bath so you don’t flood the room) and rinse off the last of the bath water, feeling it running down the drain. Keep affirming the words Thank You, aloud or to yourself. Finish with a short burst of cold water – about thirty seconds is fine. This is fantastic for your circulation and immune system. Now that we have detoxed and cleansed our body we are going to nurture and love it some more. Take your oil or body lotion, and starting with your face, neck and ears gently rub the oil into your skin. As you do this say Thank You on every out breath. Really feel yourself connecting with and nurturing your body. Thank your body from your heart. Allow yourself to feel love and gratitude for your life. Continue to apply oil, doing each arm and then your front, back and legs. Pay attention to your fingers, toes and the soles of your feet. Make sure every inch of your body is pampered and cared for. Use a towel again to blot any excess oil, and then dress in something loose and comfortable. Retire to your bedroom or somewhere else quiet and private. Lie down or sit in a comfortable chair and rest or drift off to sleep. **PS If you enjoyed this post please vote for my blog, Cauldrons and Cupcakes, in the Best Australian Blogs 2013 Competition. You can do that here. Thank you.